From an early age, Annie was acutely aware of environmental degradation and passionate about increasing sustainable practices in her communities. During her time at Bates College, she conducted research on the impact of the local agriculture movement in Maine, taught gardening and nutrition classes for community members, and spent a semester studying sustainability and renewable energy in Copenhagen. After completing her B.A. 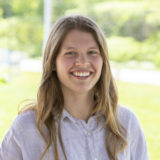 in Environmental Studies, Annie conducted solar policy research for a small renewable energy group in Portland, Maine. She is thrilled to join SunCommon and to continue to work towards a renewable energy future in New England. Annie loves the Green Mountain State and in her free time you can find her exploring its hiking trails, water holes, farm stands, and ski slopes.